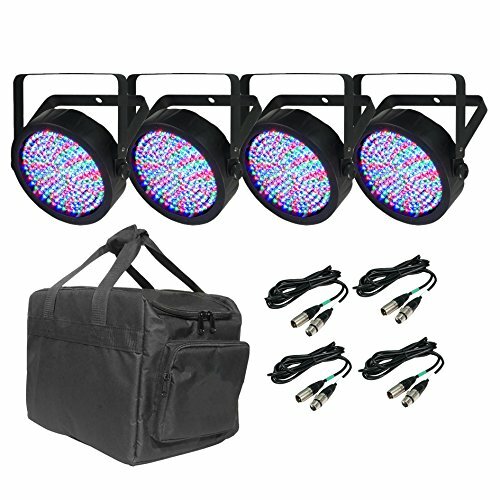 Package Includes: (4) Chauvet Slimpar 64 LED Slim Par Can Lights (4) Chauvet DMX3P25FT DMX Cables (1) Travel Bag ---------- The Chauvet Slimpar 64 is an LED PAR with a slim casing-only 2.5 inches thick-that can go almost anywhere. Boasting 180 red, green and blue LEDs, the fixture offers 3- or 7-channel of DMX control. Or you can use its built-in automated and sound-activated programs and variable speed-pulse effect for use on the fly. It also offers static colors and RGB color mixing with or without DMX and built-in power linking for quick set up and break down. Get the edge on your competition with the Chauvet Slimpar 64. Also included in the package is the Chauvet DMX Cables, which will ensure your equipment works at optimal levels. CHAUVET® produces a variety of cables for all of its fixtures, including DMX three- and five-pin connector cables in varying lengths as well as extension cables. All CHAUVET® DMX cables are made specifically for lighting and meet stringent standards of suitability and quality to provide safety, shielding and prevent transmission interferences. Finally, the included bag is perfect for carrying a small system of the popular SlimPARTM 64 and SlimPARTM 64 RGBA fixtures along with a controller and cables to go along with it. Each bag has padded internal compartments large enough to hold up to 4 SlimPARTM 64 fixtures, a small controller and cables to connect the system together.